When getting an A is not enough . . .
We have a system in our school where about five times a year teachers issue Effort Marks to students (this also goes out to their parents). As part of that system we give students a mark from 1 – 4 which reflects their academic effort. If a student is getting an A in class tests then this is supposed to merit a 1, but personally I think the bar should be set a little higher. Lots of people get A’s; if I give them all 1’s then there isn’t any mark left for those who something above and beyond the normal call of duty. Some students may not be happy with this, and some have asked me what they need to do to get that elusive 1. So here’s my answer: Enter a competition. It can be Science, Maths, or anything else with a Science/Maths theme. Maths Week is just over which can only mean that Science Week is lurking somewhere around the corner. Now everybody knows that I think ScienceWeek is a depressing indictment on our profession. Why should we need a week-long series of activities to convince students and the public that Science is interesting? Why is every week not ScienceWeek in our schools and classrooms? What does that say about us as teachers, and in particular about the rediculous syllabus we are asked to implement? Bring on the JC reform, that’s what I say. Not to mention that anything the teacher unions give out about must be good for students. Fun for all ages and Digital Cameras to be won in a fantastic competitions! The closing date for entries is this Friday 27th October. 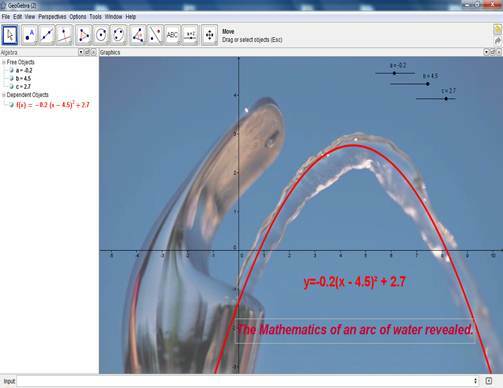 The basic idea is that students take a photo of something in their locality, import it into GeoGebra and highlight some aspect of the underlying mathematics ( see eg above). There are screencasts on the website for the competition showing how to import photos etc as well as practice photos and prepared Geogebra files with photos already inserted, so even if people don’t want to enter the competition it might be useful as a learning activity to point the students at etc. 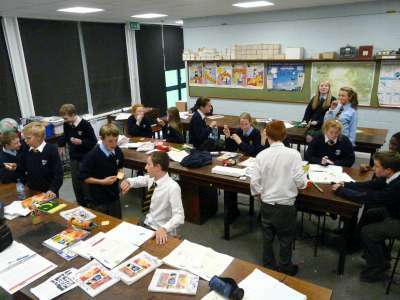 The Institute of Physics used to run “Paperclip Physics”; a competition where students had five minutes to present/teach a given topic in an interesting fashion. This year they have replaced this competition with “Planet-Scicast”, where students have to put together a two and a half minute video-clip on any aspect of Science. It’s a wonderful idea. Entries are closed for this year but I hope to encourage some of my own students to think about it over the Summer and enter next year. I know that I learned more Phyiscs in my first year of teaching than I did in the previous six years of preparing for exams. Hopefully students will benefit in a similar fashion. It takes 365 days for the Earth to orbit around the Sun, but 366 on a leap year. I’m not tech guru, and I’m still at the bottom of a very steep learning curve when it comes to incorporating ICT into my lessons, but I can’t help feeling a little dismayed whenever I hear people who should know better warn about the dangers of internet usage to the point where you imagine they would prefer if the damn thing had never been invented. “This competition should get entrants thinking about their privacy by considering :· Advantages / disadvantages of the growing use of technology as a means to recording personal information including the use of Biometrics· The security that CCTV brings Vs possible invasion of privacy· Use of RFID (radio frequency identification tags) on products · Social networking and the electronic footprints we leave behind· Are we evolving into a ‘Big Brother’ environment as depicted in George Orwells ‘1984’? Maybe I’m biased but it seems to be slanted slightly towards the “Beware the hooded monster” side of the argument. It’s not going to change public opinion or anything, but it’s a nice start, particulary if it engages students. Nice prizes too.